Although it wasn’t mentioned during Apple CEO Steve Jobs’ keynote address Monday at WWDC, Apple launched an updated version of its Safari Web browser for Mac OS X 10.5.8 and 10.6.2 or higher, as well as Windows XP SP2 or higher, Vista, and Windows 7. With the new release, Apple patched security holes, boosted performance, and introduced a handful of features that collectively have the potential to put Safari on par with Chrome and Firefox in terms of core features and performance. But what will matter most to users are the following five new or updated features. The most significant addition to Safari is — finally! — support for browser extensions. For a lot of users, browser extensions may seem like a non-event. It’s true that other browsers — Firefox, Chrome, and IE all come to mind — have supported extensions for so long that switching to one of those browsers from Safari could easily overwhelm you with the sheer number of extensions available. The new Extensions pane in Safari’s preferences. Extensions may not seem like a big deal, but it’s important because it shows Apple is finally keeping pace with rival browser-makers. That doesn’t mean it’s letting developers run rampant, however. 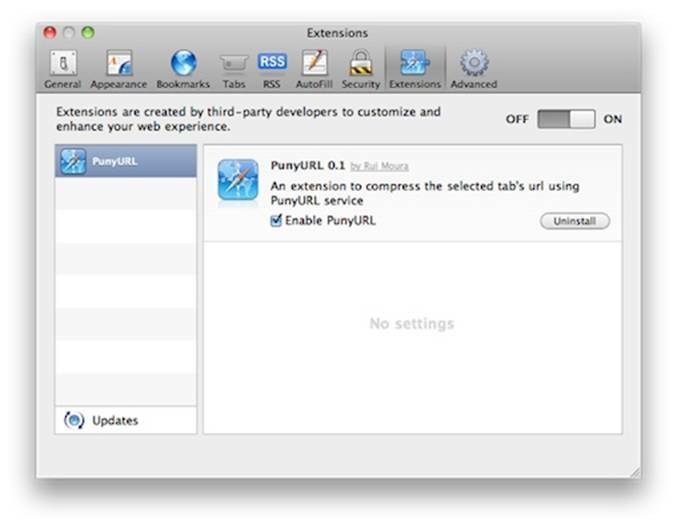 Extensions will be sandboxed to keep them from gaining unfettered access to Safari itself or to other portions of a user’s computer or data. Apple also requires that extensions be digitally signed, similar to what’s required for mobile apps in the App Store. That’s to ensure an extension hasn’t been altered by a third party and that any updates come from the original developer. One annoyance about Apple’s implementation is that extensions are disabled by default. To enable them, you must use Safari’s preferences to enable the Develop menu (there’s a checkbox on the Advanced tab), then click on the Develop menu and select Enable Extensions. The first thing I checked out in Safari 5 was the new Reader mode. This feature uses heuristic scanning of a Web page to determine whether the text there can be displayed as an article. If so, the address bar displays a Reader button. Clicking on that button will display the text portion of the page in an overlaid window that pops up. The overlay doesn’t show images or ads, but it does include links. The basic text-only display uses clear, easy-to-read type and makes for a much nicer, almost newspaper-like way of reading. It also recognizes articles that are broken up over multiple pages (as is the case with most news or magazine sites, including Computerworld.com, these days) and will load all the pages and compile them as a single stream of text, making reading even easier since you can scroll through a long, multipage article as if it were a single document. When in Reader view, you can also print the overlaid page in this printer-friendly format, e-mail it, or adjust the size of the text onscreen or in print. 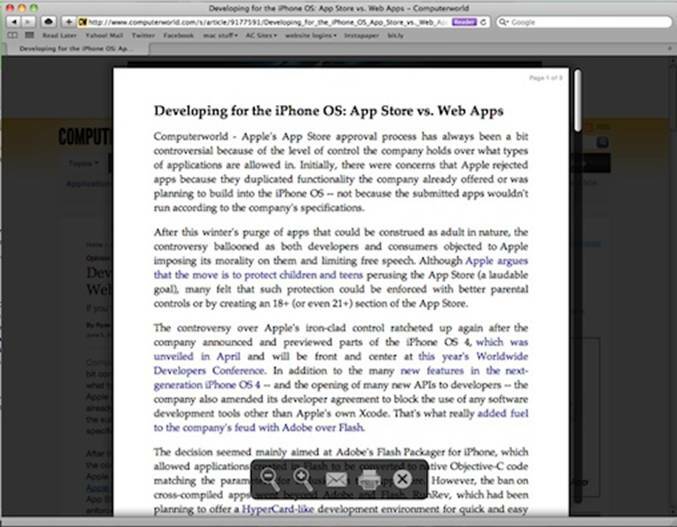 The new Reader view in Safari 5 (note the number of pages and the toolbar). Personally, this goes down as my favorite new feature in Safari and one that differentiates it from other browsers. However, the scanning technique isn’t always perfect and occasionally articles aren’t recognized as such. When that happens, the Reader option isn’t displayed. I expect this to get better as it’s refined over time. With Safari 5, Apple caught up to Chrome’s performance, partly by taking lessons from Chrome and other browsers. Like Chrome, Safari now relies on DNS pre-fetching to speed up page loading. Improvements to Safari’s caching routines also speed up the loading of images and pages that have been previously viewed. 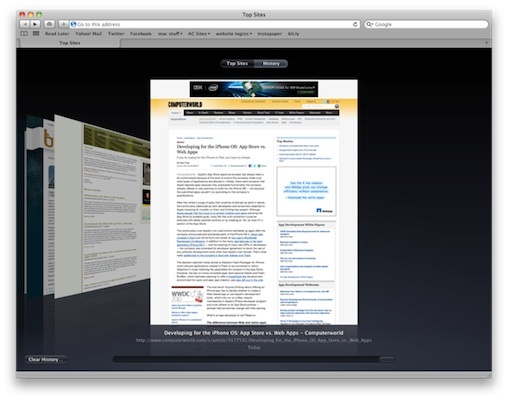 I’ve been a big fan of Apple’s Top Sites display, which showed up when Safari 4 was released as a public beta last year. Top Sites renders frequently and recently visited Web pages on a 3D “wall,” along with a blue star for sites where the browser detects updated content. The feature is easy to use and for the most part consistently displays the sites I visit first thing in the morning and throughout the day. Apple has updated Top Sites with an option to view the standard Top Sites page or a graphical history of visited pages. (The History page was previously available but not as obviously displayed.) The History view allows you to see screenshots of previously viewed sites and pages as well as to search for words/phrases in those pages. That allows only pages containing a search string to be shown. In Safari 5, Apple has added dates to the information displayed about pages when scrolling through the History view. It’s a useful feature if you’re looking for something you saw or read yesterday, last Monday, or even last month — provided you keep your history that long. The preview and full search History view is now displayed alongside the Top Sites view. Safari also now supports pinning specific Web sites to the Top Sites display by simply dragging a site’s URL from the Address Bar into the Top Sites display. This joins earlier features such as being able to exclude sites or pages from Top Sites and to pin sites to specific locations in the display. Apple revamped the Address Bar in Safari in a couple of ways. First, it restores the progress bar that displays in blue along the Address Bar as a page loads. The blue bar was axed from Safari in version 4. More important, Apple expanded the matching features of the Address Bar. In Safari 4, as you began typing a URL into the bar, Safari would attempt to offer URL auto-completion based on sites in your bookmarks or in your history. However, that matching was limited to specific parts of the URL. Predominantly, this meant the domain name or the domain name plus later portions of the URL if they exactly matched what you were typing. For instance, as I typed “computer” into the Address Bar, Safari 4 would auto-complete http://www.computerworld.com as a possible match; typing “world” would not be auto-completed with the Computerworld.com URL. Safari 5, by contrast, can actually search the entire URL regardless of where a particular word or phrase happens to be. It’s a small tweak that builds on an already useful feature. It may seem like I’m ignoring some of the more newsy changes to Safari — at least if you compare my focus here with what Apple is touting on its Safari site or in press releases. But after working with Safari 5 a bit, I picked the features that most immediately impressed me and that I think the majority of Web users will notice first. That said, I should mention three additional features that are likely of interest to hard-core techies. HTML5 — Apple has been pushing the adoption of HTML5 since the public beta of Safari 4. Certainly in the recent spat with Adobe over Flash, Apple has really ratcheted up its advocacy of HTML5 as a next-generation standard for video, animation and interactive Web design. Not surprisingly, Apple has incorporated a lot of HTML5 media features, including video and animation, closed captioning and full-screen playback of media, into Safari 5. It also supports other HTML5 components such as geolocation, draggable items/attributes, and support for components specific to handling forms, Ruby on Rails and AJAX. This has the potential to be a big deal, but HTML5 right now is still evolving. Security patches — Safari 5 patches 48 vulnerabilities that existed in previous releases. For Macs still running Tiger (Mac OS X 10.4.x), Apple has patched these same vulnerabilities in an update to Safari 4. Overall, Safari 5 is an evolutionary update to Apple’s browser. While it doesn’t provide earth-shattering changes, it does illustrate Apple’s ongoing commitment to HTML5. Most important, with the browser wars in overdrive, it offers improvements that longtime users will appreciate and that bring it closer to parity with IE8, Chrome and Firefox. Ryan Faas is a freelance writer and technology consultant specializing in Mac and multiplatform network issues.